Rokytnice nad Jizerou is actually several areas sharing the same pass (Horni Domky, Modrá Hvězda – Bahýnka, Sachrovka, Studenov, Paseky nad Jizerou). 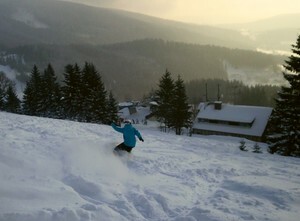 However, Paseky nad jizerou is a single resort and a member of SkiRegion. (It is quite far away to be part of Rokytnice nad Jizerou.) The area is centred on the village of Rokytnice nad Jizerou. 12.6 km of day and night skiing and boarding on beginner to intermediate slopes and one notable 1km long black (Černá) at 630m-1,312m altitude, south of Harrachov, are highlights plus the longest piste in the Czech Republic (it's the red one from the top of Lysa Hora). 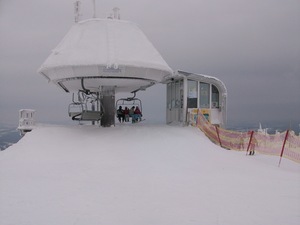 There is an efficient lift system at Rokytnice nad Jizerou, yet weekend queues seem unavoidable. A good number of kilometres of prepared cross-country ski tracks are available, many of which are part of the Krkonoše Skiing Paradise project, others are connected to the Jizerskohorská Magistrála (Jizerskohorská Main Cross-Country Network).